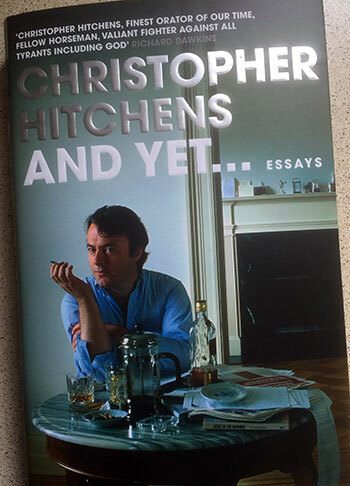 A new volume of essays by the late Christopher Hitchens is welcome news indeed were it not for the painful reminder of the inner sleeve notes which declare ‘And Yet…Essays’ the ‘final volume of peerless prose from one of the great thinkers of our time’. Quite. 2014-2015 has been a productive year by his estate, this, the fourth book of essays released in recent months offer fans both new and old a reminder of his ability to write exceptionally well on a broad number of subjects for, amongst others, Vanity Fair, London Review of Books, New Statesman and Atlantic Monthly from which these essays are taken. As with any of his other collections of essays (Arguably, Love, Poverty & War, Prepared For the Worst, Unacknowledged Legislation, For the Sake of Argument) the reader can expect a topic to suit them. Once again Hitchens demonstrates what the literary world has lost with his passing. Here in print we can read his analysis of Clive James’ Cultural Amnesia, Shalimar the Clown by Salman Rushdie, Ian Fleming’s sexual leanings, thoughts on Hillary Clinton, A.N. Wilson, Che Guevara, Hezbollah, peace talks with Iran and, well, you get the idea. I have seen two variants of the book cover, a disappointing red-yellow copy which is entirely forgettable and the UK edition opposite which perfectly captured Hitchens great loves; cigarettes, whisky, marmalade and Wodehouse. To ignore these collections because of his strong views on religion and the Iraq War would be to deny oneself an insight into the mind of a great thinker and lover of literature. His essays on books and their authors should inspire us to reread and better digest our modern greats. Hitchens frequently urged his listeners and readers to seek out information and formulate opinions of their own based on their own research. This collection is testament to that attitude and a remarkable mind.